For anyone who wants to say pancrepes over and over again like I did, here's the recipe so you can do the same. It's half the original, which makes about 6 pancrepes. I kept it simple by serving it with sliced bananas and chocolate-hazelnut spread - two things you hopefully already have on hand. If necessary to keep pancrepes warm, preheat oven to 175 degrees and place a plate in the oven to hold them before serving. In a bowl, lightly beat the eggs. Whisk in the flour, salt, milk, oil, honey, and almond extract until smooth though a few lumps are fine. Heat a large non-stick skillet or griddle over medium to medium-high heat and lightly grease with cooking spray. Working in batches, pour batter into the pan to make approximately 5-inch rounds. Cook for about 2 minutes on each side. If not serving immediately, transfer pancrepes to the plate and place in the oven to keep warm. Serve with sliced bananas, chocolate-hazelnut spread, and a dusting of powdered sugar, if desired. Love the idea of pancrepes! Perfect for when you can't decide between the two styles. They look wonderful! Thanks, Aimee. I had to try it, given the name alone. Pancrepes is definitely a fantastic name! I would probably do the same thing and say it over and over! haha And I am definitely intrigued by the mix between the two!! Oh I love the name too Monica, I can see why you had so much fun. Breakfast is not the same anymore at our house since the kids have grown and have their own families now but I miss those special mornings. Sounds like you are really enjoying yours. Have a great week! Oh, Cherie...good point. I look at my little one and wonder what life will be like in 7 years when he goes off to college (knock on wood...). Thank you for the reminder...I will be even more in the moment and enjoy the family time and meals. Why have I never heard of pancrepes before?? I want to make them so I can say the word over and over, but ALSO because they look so perfect!! Crepes are so much fun to make and so much easier than one would think and this mash-up is brilliant! Pancakes and crepes in a beautiful marriage - what fun. Thanks Monica! I love the name pancrepes! I'd love these for breakfast! That's sweet of you...it's interesting because we used to eat out/take out all the time and in the last few years, we eat far more at home. Going out for special meals is a great thing but to be healthy and for everyday, we do eat a lot at home! Thanks and enjoy the rest of the week! Now that is a stack I could inhale in moments! 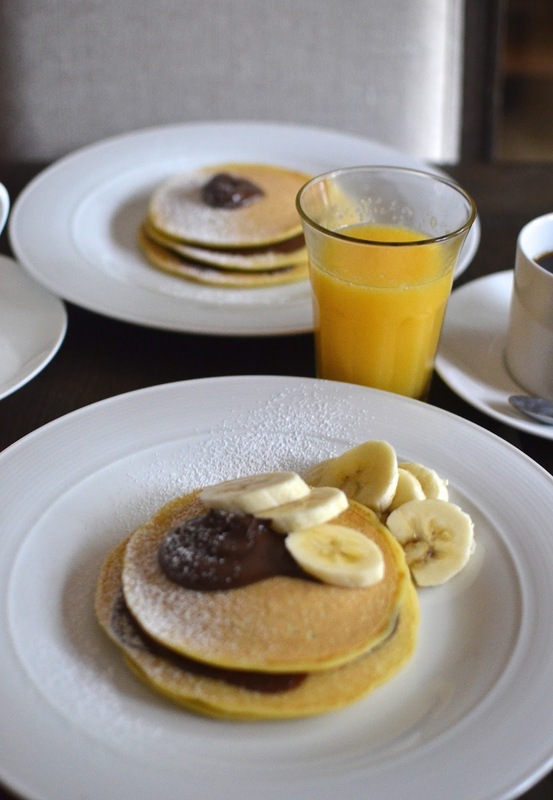 Love your toppings with bananas and nutella. So how long did it take for you to make a stack of pancrepes that high? Did you get 2 pans going at the same time? Love your breakfasts and desserts. We rarely cook desserts at home because well, it requires that whole measuring thing... LOL So I will visit you for my desserts! I love the idea of pancrepes - it's going to be my new favorite word to use! Your recipe is on my must make list! haha - I know! Such a fun title. You're right - pancrepes is a really fun word to say! LOL this is the cutest idea and I LOVE it.